From the San Diego wildfires to multi-drug-resistant strains of bacteria, communities are facing an ever-growing list of potential disasters. Some events, like pandemic flu or anthrax attacks, are public health emergencies first and foremost. Hurricane Katrina taught us, however, that lack of planning for the frail, elderly, and impoverished population can turn a natural disaster into a healthcare nightmare and lead to needless death and suffering. Emergency managers and public health professionals must integrate their prevention and response efforts to serve their communities most effectively. Disasters and Public Health is a crucial tool in planning for and responding to the health impact of any crisis situation. Bruce Clements served over 20 years in the U.S. Air Force and Air National Guard as a Public Health Officer and a Nuclear, Biological, and Chemical Warfare Defense Instructor, a Hazardous Materials Specialist with an Urban Search and Rescue Team, and as a Safety Officer with a Disaster Medical Assistance Team. He also served as the Public Health Preparedness Director of Missouri in 2006, when the state experienced a record number of disaster declarations. Throughout his years of experience, he frequently needed to track down a variety of references to quickly understand what was needed for an effective public health response in various situations. He has researched and compiled this information on the health impact of a wide range of disasters into one quick reference. Emergency managers can also no longer afford to be surprised by the next crisis that erupts. 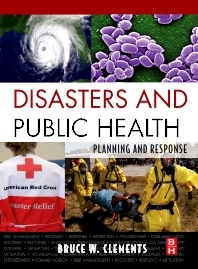 This book guides planners in both disciplines in preventing tragedies by most effectively preparing and responding when disaster strikes.